Votes have been casted, the worthy ones have been summoned, who will win the fight and gain the prize? Stay tuned, soon we will be releasing the official results! Below you can find the original 2015 Modding Awards opening article. It's that time of the year once again! 2016 is definitely the year of the modding awards. 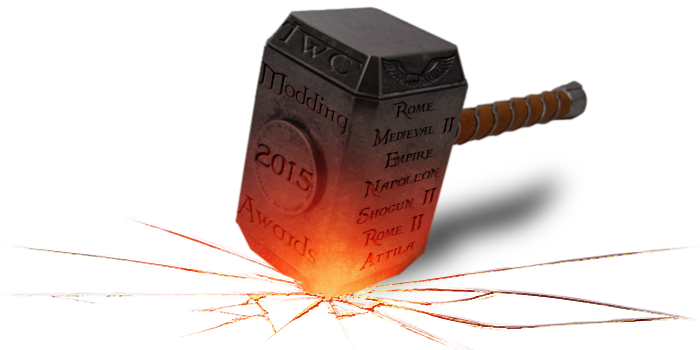 After the 2014 ones, which ended during the last July, we are pleased to inform the whole community of Total War Center that the 2015 MODDING AWARDS are now LIVE! Esteemed fellow members and visitors, it's with great pleasure that TWC and the Modding Awards Team introduce you to the latest Modding Awards. Just like for the 2014 edition all the games from Rome:Total War and up are represented. The full list include Rome I, Medieval II, Empire, Napoleon, Shogun II and Rome II. For obvious reasons very old games (specifically, Shogun I and Medieval I) are not included, while 2015 it's also the year of the release of Total War: Attila, and hence for the first time it will be possible to cast your nominations and votes for the mods released and the modders who worked on this title during last year. As usual, each title has its own specific categories, which in general sum up to Favourite Modder, Best Mod/Submod and Miscellaneous; with the purpose of covering as much categories as possible there could be more of them in specific titles, but in general the goal is to provide the voters with a consistent choice for each category. It is also important to take into account the fact that only those mods and submods who have been released or updated during 2015 will be eligible; similarly, only those modders who have released any material (might it be mods, updates, tools etc, alone or as part of a team, with credits) during 2015, will be considered elegible. Like it was for the past, the initial nomination phase should last for two weeks and another two weeks for the voting phase; please notice that it's at discretion of the Modding Awards Team to decide if to extend one or both of them, depending on the amount of nominations/votes received during the same. We really hope many will take part in this vote, just like it happened for 2014 Awards: there are so many great mods and modders out there that almost everyone has his own preferred one, so that's the best chance everybody has to show them appreciation and help them to be rewarwed with what they deserve! For what concerns the 2014 awards, if anyone missed them and is curious to know more about the last winners, it is still possible to consult the official winners thread; I take the chance to confirm that the awards and the badges linked to the last edition will be delivered very soon (it's just a mere technical issue), so please be patient about. Once again, let me also remind you that the Modding Awards Team is composed by volunteers, who spend a lot of their (sometimes limited) spare time in this project, so please just save a minute to check their names and, if you feel like they deserve it, drop them some rep. Simply copy/paste the code in the box in your signature, it will be much appreciated! Finally, the recruitment of volunteers for the 2015 Modding Award is still open (we could do use of some extra help); please feel free to contact with Hader if you want to propose yourself for the role or if you are interested in helping out with the next editions, the whole TWC will be grateful of your contribution and you will do a great service to the site and to the community! The Voting Phase is now over; results will be made public very soon! Hope to have the results soon. Good luck to everyone!